There was a time, prior to wholly partnering with Disney, when Pixar was seen as a perfectionist, when it set and consistently met the benchmark for animation’s gold standard. Even if some in the fan fold felt A Bug’s Life was less than stellar, few could argue their preeminence or predominance. Every release was an event, every trip to the Oscars a given (except in those rare cases when the Academy got it wrong). Then Cars came along and caused some minor concern. Luckily, what followed were four films — Ratatouille, Wall-E, Up, and Toy Story 3 — which redefined their majesty. Then Cars 2 destroyed it all, once again, throwing into question the company’s purpose and position under the domineering force of the House of Mouse and its “anything for a dollar” marketing dynamic. It will be a concern voiced again when Monsters University gets its moment in the cinematic sun. While fun and enjoyable, it’s light years from the original in terms of concept and invention. The first film was a wonderful combination of childhood fears, narrative originality, and personable voice work. For this second time around with these characters, things are still light and likeable, but they also feel a bit forced and routine. 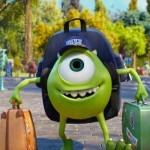 For the one-eyed green goblin known as Mike Wazowski (Billy Crystal), childhood revolves around one goal — to become a champion scarer for the Monsters, Inc. corporation. He studies hard, applies himself, and finally makes it into Monsters University, a college where the Department of Scaring is led by the infamous headmistress, Dean Hardscrabble (Helen Mirren). Rooming with fellow fright major Randall Boggs (Steve Buscemi), he learns that he will only advance into the program should he pass the daunting final exam. Throughout the course of the semester, he has several run-ins with MU legacy and king goof-off James P. “Sully” Sullivan (John Goodman). Their eventual rivalry ends up costing them both a chance at advancement. 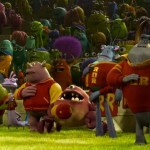 When they learn that the winners of the campus wide Scare Games will be given renewed access to the privileged school, they join up with the goofy geek frat Oozma Kappa whose residents include Momma’s boy “Squishy” (Peter Sohn), the two headed twins Terri (Sean Hayes) and Terry (Dave Foley) Perry, middle aged student Don Carlton (Joel Murray), and furry leg beast Art (Charlie Day). They hope to beat the other Houses and win the title. Of course, it all depends on if Mike and Sully can get along. Just like a spoonful of sugar after some bitter medicine, however, the joyful, jubilant nature of Monsters University keeps the formula and cinematic shortcuts from seeming so bad. All the actors are in good form and the script frequently delivers bountiful belly laughs. When compared to the original Monsters Inc., it’s merely acceptable. When placed against the path Pixar and Disney intends to pursue over the next few years, Monsters University shows promise, not more problems.